Few things are as traditionally Mexican as the tamale. Tamales are usually savory meat or vegetable filling wrapped in a cozy blanket of masa dough, shielded and formed by corn husks and then steamed to a creamy tender delight. But they can also have cheese or sweet fillings and have been around since the time of the Aztecs. I have not usually been a fan of tamales, since the ones that I have had have been gritty to the teeth and have been generally poorly prepared and not all the flavorful, this changed during recently when I was lucky enough to take a chance on some tamales from Tzango Cocina del Mundo on Hartley Bridge Road in Southern Bibb County. Tzango’s Oaxaca Tamale Dinner comes with two tamales, sour cream, sauce, and a side crema salad. 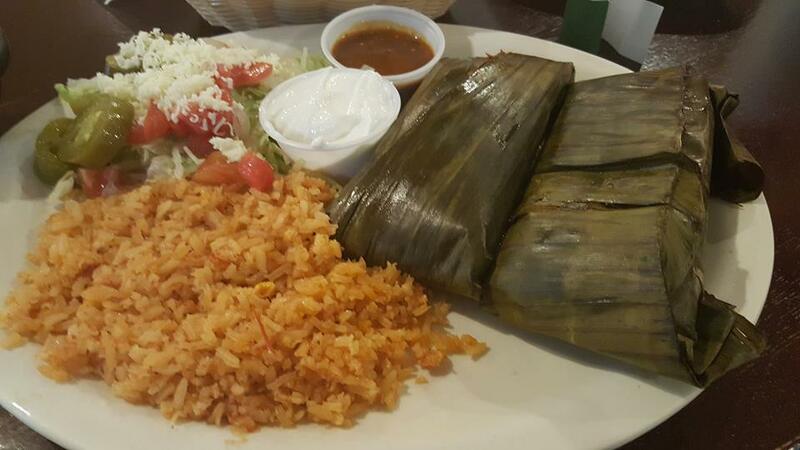 The tamales are pictured here inside the protective banana leaf wrapper, which should be removed before eating. Photo by Doug Deal. Although likely out of the way for many who may read this, the extra drive is well worth it if you are craving a tamale. Although pork is usually the filling of choice, Tzango makes theirs with a spicy marinated shredded chicken. You won’t miss the pork. 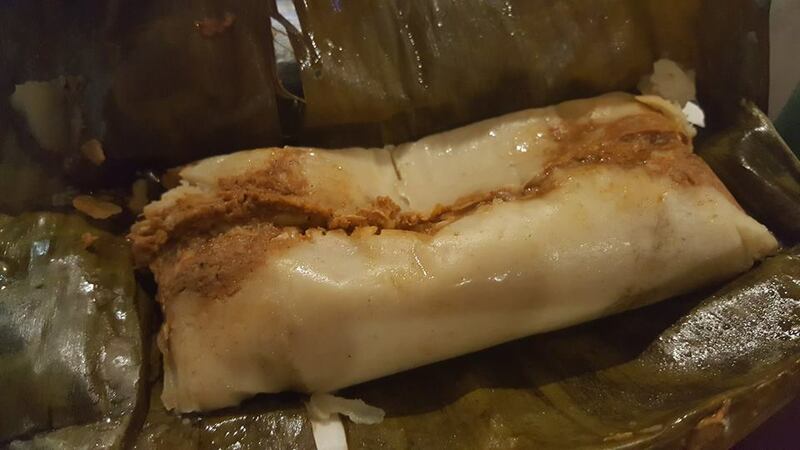 Another change is that they wrap their tamales in a banana/plantain leaf instead of a corn husk. This is a subtle modification, but a good one as it is a little like unwrapping a Christmas present. You can order them a-la-carte or as a meal of two with sides of rice and crema salad for just $10. They are so good, they inspired me to make my own tamales at home. Mine were also pretty tasty, but it is not worth the effort if you can get the Oaxaca Tamale Dinner at Tzango for a reasonable price. Tzango chicken tamales are a family recipe. After steaming the masa dough comes out in a dumpling like texture with hints of corn. The slow cooked marinated chicken is extremely flavorful. Be sure to remove the banana leaf before eating. Photo by Doug Deal. Tamales are not all they have. 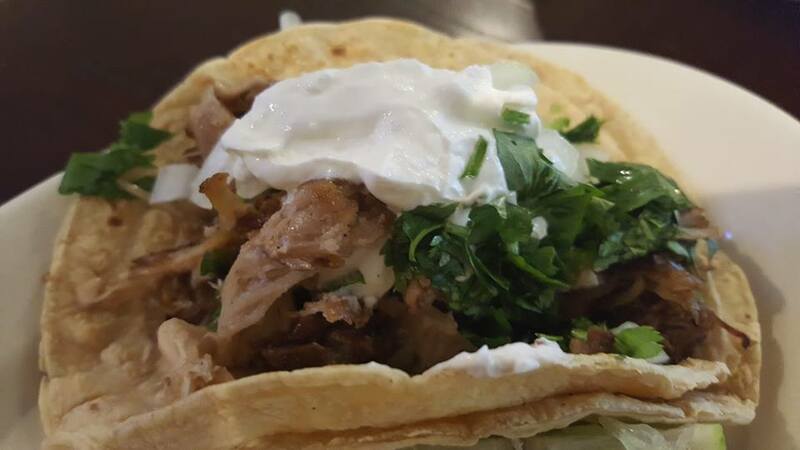 They also have a delicious selection of tacos, starting with the regular ground beef taco and working up to gourmet soft tacos with ingredients such as steak, marinated pork, shredded brisket, shrimp, chorizo, chicken and fish. For the adventurous they also have ox tongue. I have tried most and for $9 for three, it’s a pretty good deal and quite filling. Beyond that and other traditional Mexican food favorites, they have a number of dishes that would appeal to those who want something with less carbs. Besides, fajitas, they also have a signature platter which is grilled meat with or without veggies. Also on the middle is pork chops, carne asada (thin sliced grilled and marinated steak) as well Fire Steak, which is a 10oz sirloin topped with spicy peppers and salsa. All of these are fantastic and reasonably price, albeit the sirloin is a bit more expensive that the others. The marinated pork in this gourmet soft taco is perfectly accented with a little cilantro, lime and sour cream. Tzango has a whole selection of tacos for whatever flavor you savor, $3.50 each or three for $9.00. Photo by Doug Deal. Sandwich or “tortas” are also on the menu and they feature a different one each day, but the waitress says they are all available any day. Monday, the featured sandwich is the Torta Cubana, which is a traditional Cuban sandwich with shredded pork, cheese and pickles on a Portuguese roll. One of my favorites. For $8, it includes fries and choice of chips, salad or rice and beans. Lastly, the service has been excellent. They are always friendly and quick to ask if you need anything. Tzango is open 11-9 Monday through Thursday, 11-10 on Friday, 4-9:30 on Saturday and 11:30-9 on Sunday. They are at 3045 Hartley Bridge Rd, Suite B in South Macon. Their phone number is (478) 784-8858.